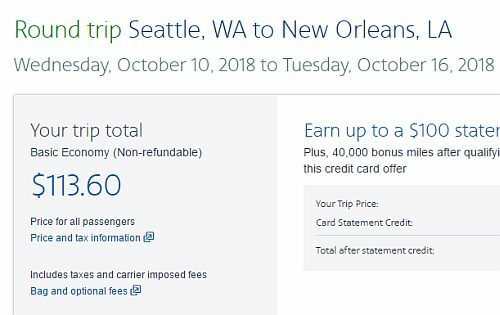 American Airlines has dropped the price of some of their October, November and December flights from Seattle to New Orleans, Louisiana down to $148 CAD roundtrip including taxes. The flights have 1 stop each way, in Los Angeles or Dallas. - click on the departure date box to open up the calendar view and look for the dates that are $147 CAD roundtrip. 2. Click through from Google Flights to the American Airlines website. On the American Airlines website, the price will show up as $113 USD roundtrip. This will work out to $148 CAD roundtrip when booked using a Canadian credit card, and including the typical 2.5% credit card foreign exchange fee. seattle, sea, american airlines, united states, north america, new orleans, louisiana and msy. One Response to "Seattle to New Orleans, Louisiana - $148 CAD roundtrip including taxes"
Thank you for all your help ! I flew with one of your deals in the past ! If it happens to find anything from Miami to Vancouver in November and post it, it would be amazing, thank you in advance !